There is no doubt that our horses are talented athletes. Just as human athletes need to prepare for exertion with warm up activities; our horses need to be prepared as well. There are many stretches and calisthenics that can be used to help keep their bodies in shape. Stretches help to increase circulation through muscles, loosens up joints and the spaces between the vertebrae. A good stretching program will lead to increased flexibility and can prevent injuries. Always consult with your veterinarian before starting a stretching exercise program. There are a few important things to consider. The most important thing to keep in mind when starting to use stretches is safety. When selecting an area to work, you need to plan ahead to protect the safety of the handler and the safety of the horse. Stay close to the horse, and in a safe spot to avoid being kicked. Be aware of the horse and watch your feet. In the beginning have another person hold the horse while you do the leg stretches. It also is helpful to stand next to a safe, solid wall with good footing, so that the horse does not move their hindquarters. Do not cross-tie the horse to do the stretches. Stretching exercises are more effective on “warm” muscles because the soft tissue is more elastic, easier to stretch, and less likely to be damaged. 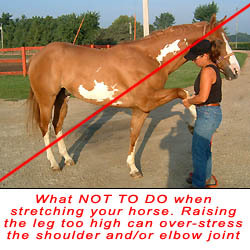 Thus the best time to stretch your horse is after a short warm-up routine or after your workout. You should plan on taking about 10 minutes to perform the exercises. 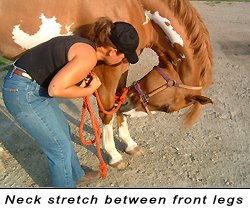 Slow, gentle stretches are more effective and less likely to cause injury to you or your horse. Never jerk or pull against a horse that is resisting. Simply stop and ask again. Remember the saying, “Rome was not built in Day”, start slow, and ask for partial stretches. Start with easy stretches and work on increasing the time and length of the stretch. Encourage the horse to stretch as far as he feels comfortable, never stretching beyond his limits. Overstretching can cause injuries. Adding a stretching exercise program to your horse’s workout routine should increase your horse’s flexibility over time. The following is a list of Basic Stretches that I recommend to my chiropractic and acupuncture patients. You may do all of these stretches every day, or you may try different ones on different days to measure their individual effectiveness for your horse and your activities. Once you find the exercises that work best for your horse, in the amount of time you can provide, you will have created a warm up routine tailored to the needs of your horse. comfortably to each side. The goal is to do this with while the horse’s legs stay planted in one spot. Many people do stretches like this while mounted by pulling on the reins which also has its benefits. 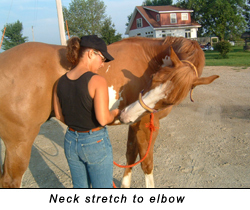 Neck stretches from the ground are more passive, allowing the horse to work its muscles without the pressure of a bit in its mouth or weight in the saddle. They make a wonderful warm up to those stretches used while mounted. When the horse can stretch easily to each elbow, you can vary the exercises by following the treat to each flank area, each front foot, and to each side of the withers, and also down between the front feet. You know your stretching exercise has been successful when your horse can comfortably reach to each side while standing in one spot. Often times the horse will take a deep breath, lick or chew which is a sign that they are relaxed. 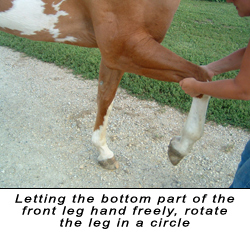 Start by picking up the front leg as you would to pick out the hoof. Look at the angle of the shoulder, and stretch the front limb out in front of the horse, down and forward at the angle of the shoulder. 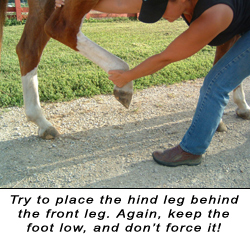 Keep the hoof low to the ground to avoid stressing the joints, tendons, ligaments, or muscles. If your horse resists you, do not pull against the horse, this could cause damage to the soft tissue. Next, hold the leg just under the carpus (or “Knee”), and let the bottom of the leg hang freely. Rotate in circle about three times towards the other leg. Be sure to not raise the leg too high to over stress the shoulder or elbow joint. In order to stretch the muscle in front of the shoulder, pick up the foot and hold one hand on the fetlock and the other above the knee, and try to place the front foot in front of the hind foot. Most horses cannot stretch all the way back so do not force them. Again, keep the foot low to the ground to avoid stress on the soft tissue, and never force the horse if they are resisting you. 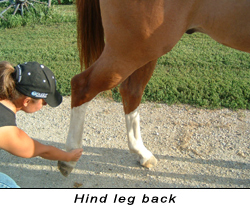 Start by picking up the hind leg as if you were picking out the hoof, gently extend the leg back and down. DO NOT FORCE THIS STRETCH OR YOU WILL STRAIN THE HOCK OR STIFLE. Sometimes the horse will stretch the leg back themselves and that is great. 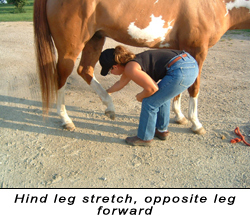 The second hind leg stretch involves holding the back leg with one hand by the fetlock and the other hand supports the leg above the hock. Gently try to place the hind leg behind the front leg. Many horses cannot reach all the ways forward. Do not force the issue. Keep the foot low to the ground to avoid stress on the soft tissue. When you have mastered the second hind leg stretch you are ready for diagonal hind leg stretch. 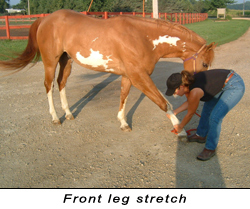 This stretch involves picking up the right hind leg from the opposite side, under the horse’s belly. Try to stretch the right hind leg and place it behind the left front foot. Do the same thing with the left hind leg from the right side. With a firm blunt object, (pen cap, hoof pick with a blunt edge, fake fingernails, etc.) apply firm direct pressure under the belly on midline to get the horse to round its back and lift. These are his “crunches” used to tone his abdominals. This exercise also helps warm up his back. Do this about two or three times, as long as the horse is comfortable. Do not startle the horse, and watch the horse’s hind legs, sometimes they mistake your blunt object as an annoying fly and will try to kick at you! Be safe! Quietly stand on the side of the horse next to the hind leg in a safe spot. Place each hand on either side of the rump about a hand’s width (approx. 4 inches) off of the top midline. Again use a firm blunt object and apply even pressure as you move down the horse’s rump and end up in the muscle groove on the back of the hindquarters. Your horse should round and lift its back, flexing the lumbosacral area. Again do not startle the horse and watch those hind legs! Be Safe! In summary, creating a tailored stretching program for your horse can increase their flexibility and may prevent injuries. You should consult with your equine health professional before you start a program because improper stretches can make a previous injury worse. Safety of the horse and the handler must be taken into consideration. A 10 minute stretching program each day will create a unique bond between you and your horse as you work towards improving their health and performance.